August 14th was a very busy day for the North Carolina Wing. This month’s commander’s call included recognition of a member who has set a positive example for all volunteers, and other awards included unit citations and the official granting of a CAP charter. Maj. John Kay was awarded the Meritorious Service Award for his work as a group commander. Maj Kay currently serves as the NC Wing Chief of Staff. A new CAP Charter was granted to MER-NC-171, Sandhills Composite Squadron. Capt Chris Cody accepted the charter on behalf of his membership. He stated that the new unit grew out of the Fayetteville Composite Squadron and is based at the Fayetteville airport. Capt. 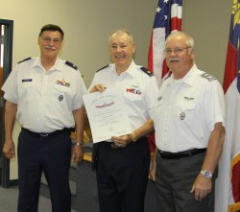 Jerry Simmons, commander of the Johnston Co. Cadet Squadron received the Unit Citation Award, and 1st. Lt Brian Cail also took a Unit Citation to his Franklin Co. Composite Squadron. Following the awards ceremony Wing Commander, Col. Roy Douglass, put in a bid for the upcoming Wing Conference. Col. Douglass reviewed the many special activities that await the members and spouses attending. The afternoon session was devoted to the Subordinate Unit Inspection for the wing’s Group 1. Members are reminded that the time for registration for the conference and reserving a room at the Hilton Hotel in Wilmington is drawing near. The membership is urged to act quickly as the number of rooms available at the hotel may soon be in short supply. The current schedule calls for the General Assembly on Saturday morning, September 18. This session will include Col. Douglass’ State of the Wing Presentation followed by awards and promotions. The afternoon session will include seminars produced by the wing staff covering Communications, Emergency Services, Operations, a special session on Ethics in CAP, Public Affairs, Personnel and other great topics.